Gunmen were spotted on a platform attached to two mysterious black helicopters flying over the Kremlin in Russia. Shocking footage of the incident quickly went viral, sparking fears over the meaning behind the two black helicopters in the capital. 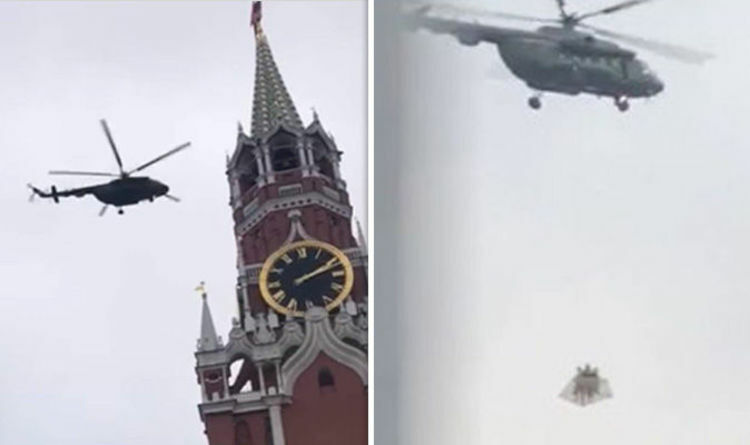 In the video, members of the public can be seen pointing at two helicopters taking off near Moscow’s Red Square in broad daylight. While one of the helicopters can be seen carrying armed personnel, another is transporting an unidentified cargo. The helicopter takes off from a helipad within Kremlin walls and could later be seen flying above central Moscow, even though helicopter flights are forbidden in the city. Conspiracy theories soon spread, ranging from whether President Vladimir Putin was under emergency evacuation or training for rapid deployment of combat forces within the city. Others raised questions about a potential coup in Moscow, while another theories speculated about the "secret cargo" on board of the mysterious helicopters. In an attempt to quell the public fears, the Kremlin has insisted the armed men were part of "a routine drill". The Federal Protective Service, (FPS) whose officers are responsible for security for Mr Putin and other top officials, have now responded - 24 hours after the incident. A spokesman said: "Nothing unusual happened, planned autumn drills were held as they always are in recent years." Despite this clarification, authorities did not officially announce any flights over the Kremlin beforehand and the identity of the passengers and the nature of the cargo remain a mystery. The FPS insisted that further flights like the one spotted this week would follow as part of planned drills.